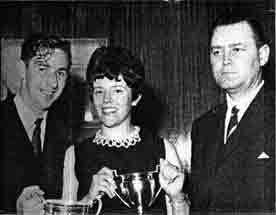 Champion Darts Player, that's H Duncan, left, who won the Tennent Caledonian Breweries West Region singles title from a big entry at the Gaiety. Mr Duncan, seen with his wife and Mr R J Kirkman, West area regional manager for Tennent Caledonian Breweries., plays at the Old Spot Bar, Rutherglen. The team championship was won by Bellfield Bar, Kilmarnock. Prizes were presented by W R C Elliot, managing director, Tennents Caledonian Breweries. 1967.